Sometimes the best way to communicate isn’t the newest trend. A telegraph operator at work; source. Trendy, or tried and true? What’s the best way to communicate with your website visitors, sales prospects, customers, or even your coworkers or employees? Lately, there’s been a lot of buzz around innovations in instant messaging—Slack is a Silicon Valley darling, and it seems like some big players are going all-in on chatbots. Companies like Zappos, meanwhile, have planted their flag firmly in mastering the art of customer phone calls. But what if your business doesn’t have a call center or even a dedicated customer service team? And what if you don’t have the time or expertise to try using chatbots? There’s a simple, straightforward answer that’s already been in use for decades: email. Email remains one of the most common, even preferred, forms of communication. It’s everywhere, all the time. 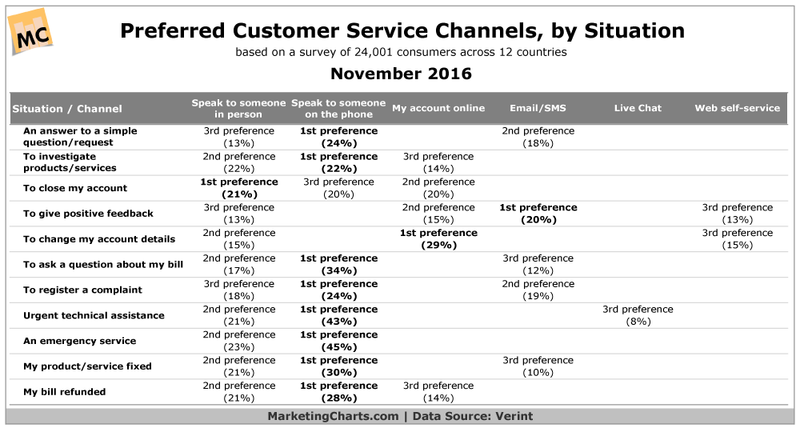 According to Marketing Charts, email is the preferred customer choice for sharing positive feedback, and is second only to a phone call for answering a simple question or registering a complaint. To put it simply, your customers are expecting to email you, and they’re expecting you to respond. The problem is that most companies are terrible at replying to emails. According to a BenchmarkPortal study, 79 percent of small businesses responded to their customer emails with incomplete or inaccurate information. Half of those companies failed to respond altogether. For small businesses, this is a costly mistake. 91 percent of respondents in an Accenture study reported being frustrated by having to contact a company about the same issue more than once. According to that same study, 66 percent of global customers switched to a competitor after a poor customer experience. As David Pierce wrote for Wired, email isn’t dying, but it is broken. Perhaps more accurately, the way we—and especially companies—use email is broken. Now, if those numbers discourage you, don’t worry—the truth is that your business has an incredible opportunity. With some training and attention to process, anyone who touches email in your company can do better. By simply improving your email responses, you can keep your customers around longer. If you’re able to respond quickly with accurate, helpful information, you may even convert your competitor’s frustrated customers, too. It’s going to take a little bit of work, but once you and your team get the hang of it, it’ll pay off in a big way. To help you out, we’ve put together a six-step checklist that will improve your email responses. You can read through my explanation below, or click here to download it so you can share it with your team. If you print it out, it’ll make a great checklist to keep near your computer so you can reference it frequently. When you receive an email, you can follow these steps to write clear, helpful replies. Done? Great! Now read it again. It’s easy to miss important details the first time around. Most email readers skim through an email in less than 8 seconds. Try to do better than that by actually reading and re-reading the message. It may seem like a waste of your time, but you’ll be surprised how often your brain adds or removes words while reading. Context matters. Emotions and underlying intent can be harder to convey and understand in written form. Ask yourself the following questions to get a stronger sense of how you can help. What’s the problem, if any? What’s your sender’s goal or intent? Can you tell how they’re feeling? Are they angry? Happy? Neutral? What level of priority level does the email have: normal, high, or urgent? Is this urgent? To determine the priority of the email, you’ll have to consider two things: the nature of the problem (something wrong/broken versus a generic question) and the time expected to offer a solution (does the problem need an answer as soon as possible?). If you’re working with a team, then there’s a third factor to consider: does the issue need to be resolved by someone with more expertise or authority on your team? Perhaps you don’t have access to private information, or need a co-worker from IT to provide a technical solution. If that’s true, you’ll want to increase the priority level of the issue. As a team, make sure you’re all on the same page about message priority. Your particular organization might have (or need to create) specific guidelines. Don’t put it off. Customers expect a timely response. If they’ve given you an opportunity to address their concern, take that seriously. Generally, aim for responding within 24 to 48 hours, but work with your team to establish a response time goal. If it’s an easy issue that you can solve on your own, you can skip straight to writing your response. Do you need to gather more information, like account numbers, support documentation, or something else? If so, take the time to gather all your resources. Do you need team support? Maybe you want to offer a discount and need a supervisor’s approval. Or maybe the sender’s issue is more of a misunderstanding that requires more education rather than a fix. If the priority seems urgent or the sender is hostile, then you may want to check in with your team for a little support in getting your own tone and response right. Start with empathy. It’s one of the best customer service superpowers you can hone. It’s too easy to read text on a screen and forget that a real human with real emotions took the time to write it. If you understand how they’re feeling, acknowledge that in your response. Recognizing someone else’s perspective doesn’t mean that you’re accepting responsibility, but it makes a big difference when your reader knows that he or she is understood. Confirm the problem and goal. By reiterating what you understand is the sender’s stated problem or intent, you accomplish two things. First, you’re helping them feel heard. Second, you’re providing the opportunity for your recipient to further clarify the issue in case you’ve misunderstood. Commit to a resolution. It’s important to communicate that you’re going to stick with your reader until their issue is resolved. No one wants to feel like they’ve been added to a line of customers, or fallen into an abyss where they might never get a response. Be there for your reader. Offer a clear and concise solution, or CC a team member and ask for their assistance directly within the email conversation. If possible, use the opportunity to also educate your reader on how they might be able to find a solution to this or other problems in the future. If you have support documentation, offer some links that further explain the solution. Cultivate the relationship by avoiding a “one and done” response. The way to do this it by inviting a reply. Encourage your reader to let you know if you’ve reached a solution, or if there’s more you can do to help. Before you hit send, take one last look through your email to catch any typos, or find phrases that need to be reworded. If you’re not a very experienced writer, feel free to ask a coworker to read through your response. How did you do? Whether your reader sends a reply or not, it’s nice to follow up with them again after a day or so. When you do follow up, include a satisfaction survey, or simply ask them to reply with feedback on how well you cared for their initial request. With customer satisfaction scores, you can start to quantify and measure how well your whole team is doing with email responses. Those scores can also help you identify ways to improve. How can you do better? It’s also important to create a feedback loop for your team. Regularly ask coworkers for suggestions on how you could improve your responses in the future. Develop your FAQs. If you notice that a frequent number of your incoming emails relate to the same topics or issues, start tracking and reporting those issues to your team. That will give you an opportunity to improve internal processes or update a “Frequently Asked Questions” page that can be used to answer recurring issues. You can even use those FAQ pages as templates for responses to common questions. I was trying to log in to my account and my access keeps getting denied. I know my password is right but now I’m locked out and can’t even try anymore. I’ve had it. You guys must have changed my account and I really need to log in today before I leave for vacation. I’m really sorry to hear that you can’t access your account. That sounds like a frustrating experience, and I’d be happy to help you get back into your account. It looks like your account password was changed on October 21st. I’ve unlocked your account, and sent a temporary password to the email address that’s associated with the account. By clicking the link within that email, you should be able to choose a new, secure password. I know you’re headed out on vacation soon, so please let me know if you received that email, and whether or not you were able to log back in. Thanks, and enjoy your vacation time! How helpful was this response? So there you have it: a six-step checklist that will help you make every response clear, accurate, and helpful. The ability to write helpful and well-considered email responses is an important tool for your toolbox for building long-term relationships with your customers, prospects, and team.